The MV88+ Video Kit, Shure’s latest addition to its MOTIV line of digital microphones and portable recording solutions, was used by each producer to capture audio. 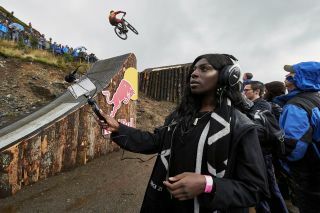 The producers leveraged the all-in-one solution to record professional-quality content on-the-go, transforming the three Red Bull events into more than just a visual spectacle. The highly immersive audio recordings provide a “you are there” experience, offering listeners the opportunity to see, feel, and hear each and every gut-wrenching aspect of the events. The MV88+ Video Kit includes a Manfrotto PIXI tripod, phone clamp, and mount as well as iOS and USB-C cables for next-level compatibility and connectivity. The three producers attended three of Red Bull’s most iconic events across the globe to create three unique soundscapes using the MV88+ Video Kit, recording moments from each spectacle. NTS Radio regular Anz kicked things off at the Red Bull Hardline in Wales, capturing the sounds and excitement of one of the toughest mountain bike races in the world. Up next was Red Bull’s Air Race in the U.S., which brings together the world’s best racing pilots. South London producer/DJ Shy One recorded the unique soundscapes of race-planes hitting speeds of nearly 240 miles per hour, mixing them into an ear-catching track. In Japan, Coconut Beats head HAAi recorded audio from the Red Bull Crashed Ice. She captured split-second sounds as athletes dropped, hair pinned, and turned at speeds of up to 50 miles per hour.